Choose a color that will make your sale stand out. When getting rid of the winter wears in your store, have you ever considered drawing extra attention to your sale by having a custom logo mat? You probably have one to greet guests as they enter your place of business, but having an entrance mat that alerts attention to the fact that you’re having a sale could increase foot traffic. Go about purchasing a logo mat as you normally would, but add an enticing note for customers to come in and shop the sale – or even just using “Sale” in place of your normal business logo. This is a great way to draw attention to the promotion you have going on. If you have the sale multiple times a year, consider saying that on the logo mat, like semi-annual or annual or monthly. This is a great way to let customers know that they can expect these kinds of deals on a regular basis. You might even consider choosing a different color than your normal entrance mat. By selecting an eye-catching color, you increase the chances of drawing the eye of passersby, particularly if your store is in a busy area that sees a lot of foot traffic. You need to think about your logo. Choosing a logo can be one of the biggest decisions you make when starting a small business. This logo will eventually appear on everything from your business cards to your welcome mat to the sign everyone sees when they first enter your business. You need to make sure the branding is cohesive throughout. According to Forbes, while you could leave the logo creation up to a graphic designer, it’s important that you have some input. You know your brand better than anyone, and you need to be able to properly convey what it is to your customers. You may not need to have a background in design, but you should try to have some ideas in your head to someone who is able to execute. While you may look to others for inspiration, your creation should be totally your own. Mashable suggests making sure that your logo is unique to your business, so customers are able to pick it out immediately. When it looks as if you’ve copied it from another company, it could lead to accusations of plagiarism. No matter what kind of industry you’re in, you want to show people that you’re creative, and a logo can help with that. 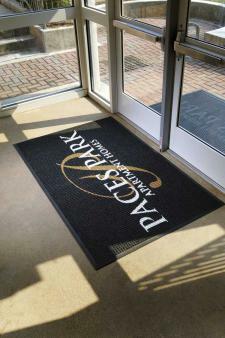 Entrance mats can keep your office clean. Have you ever considered a change in your office space? The lobby is the first thing someone sees when they enter, other than maybe the logo entrance mat that greets them at the door, and taking the time to do a refresh can have potential customers, employees and guests feeling like they’re walking into a brand new, fresh space. It doesn’t have to be major changes, even simple adjustments can make a difference. According to American Coin-Op, taking the time to wipe down all surfaces and keeping the floors clean on a regular basis can give the space the feeling of newness. Entrance mats can help keep the floors tidy, as they provide traction on the bottom of shoes that helps stop dirt and grime from traveling any further. Keeping the workplace clean is a team effort. In addition to having mats to lock onto the dirt, Monster reports that cleaning supplies should be readily available. Whether you’re able to pay for a cleaning crew to visit on a regular basis, or you encourage employees to pitch in wherever they can. The news provider suggests designating responsibilities to employees, so they know exactly what they need to do to keep the workspace clean. Entrance mats provide a nice contrast to minimalism. They say in office decor, less can be more. You never want to overwhelm your guests with too much decorating, accessorizing and loud wall hangings. Instead, it’s smarter to keep with muted tones, minimalist furniture and instead leaving it to the pops of colors and accent pieces to make a statement. Something like a logo mat can be a great accent piece in the lobby, leaving the company’s logo colors to add a pop. According to the Huffington Post, minimalist office designs are trending, particularly in fields like medicine and research. Any profession that is known for its organizing can do well to have a minimalist design. This way, the employees and clients who are typically used to clean and organized workspaces aren’t caught off guard. The news provider also suggests that building managers in this environment should try and make sure to have all surfaces clean at all times, particularly with the usage of bright lights, which is common in these kinds of environments. Other sleek ideas include using lots of glass to separate different parts of the office and incorporating a lot of white and sterile decorating ideas, according to DesignTrends. Futuristic furniture is also a big aspect of minimalist decorating.